This past weekend, UT students had the opportunity to see UT’s production of Beehive: The 60’s musical, directed by Karla Hartley. The small cast consisted of only six females, UT musical theatre students Mollie Posnik, Nina Finocchario, Jade Turner, Angela Tompkins, Dayja Legg and Marissa Volpe. 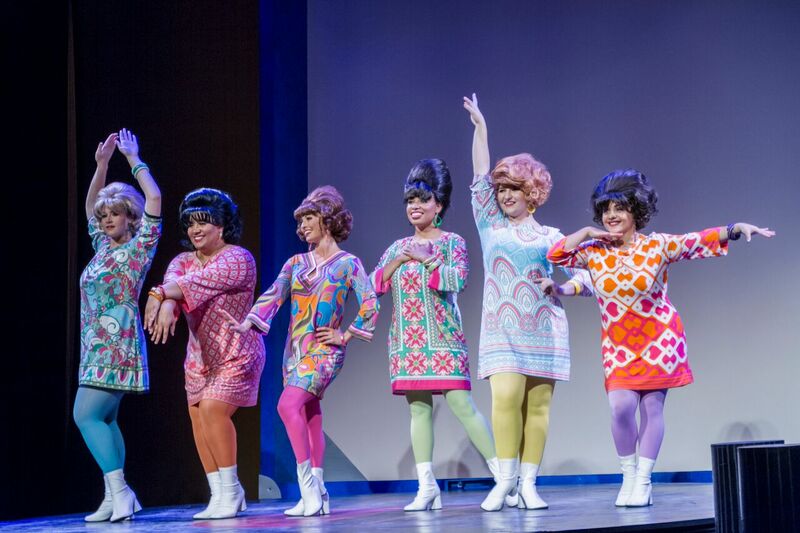 Beehive: The 60’s Musical is a celebration of empowerment in the 1960’s. It is told from the perspective of six young women who grew up in that decade. The musical, which was very different than most, consisted of mainly songs with very little dialogue that gave the audience a bit of a history lesson in between songs. The set for the musical was one of a kind, a moving record player that stood as a platform for the actresses on stage. And with only a projector in the back providing corresponding images for each song, the set was very minimal but exceptional to say the least. Tompkins answered some questions about her experience being in Beehive. Minaret: What was your experience like being a cast member in Beehive? Tompkins: It was very demanding of my time and imagination. Rehearsals were Thursday-Sunday night from 7-11 p.m. and the first weeks consisted of us experimenting with a script that barely contained a story plot. Also because Beehive is a musical review, there are various versions of it and our director selected a score that had never been used. So it was up to me to organically create and develop my character. This process soon became such a blast and I really felt like I grew as a performer because of it. M: Did you ever feel that there was a lot of pressure with only a cast of six? T:Yes and no. There’s less pressure because directors have more time to spend helping you and answering any questions. On the other hand, choreography and vocal mistakes are so much more obvious because everything is designed to be really tight so I had to know my parts super well. M: Did you feel as though Beehive gave you information about the ‘60s that you didn’t already know? T:Yes! I never realized the ‘60s had so many epic female singers! Or how much the songs reflected what the women of that time period were going through. And also how much women’s rights, fashion and music changed in just decade. M: What was it like wearing those cool costumes and wigs from the ‘60s? T: When I changed into my first costume and wig, I literally started squealing at my reflection in the mirror. It felt like I had been completely transported to the ‘60s and I couldn’t believe how much I reminded myself of my grandma. Also, the costumes really helped me to dive into my character so much more. M: What was your favorite song to perform? T: My favorite song to perform was “Goldfinger.” At first I couldn’t stand it because it sounded really boring with the piano but then when I heard it with the band, I felt like such a James Bond girl and what girl wouldn’t love that? I also got to go full out with the choreography and sing on a rotating stage so it was a pretty thrilling experience.